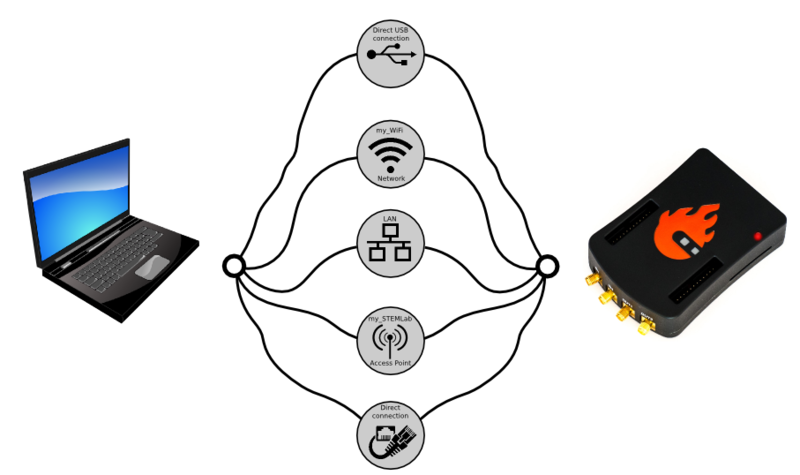 Red Pitaya STEMlab boards are network attachable devices focused on simple connectivity and quick accessibility. 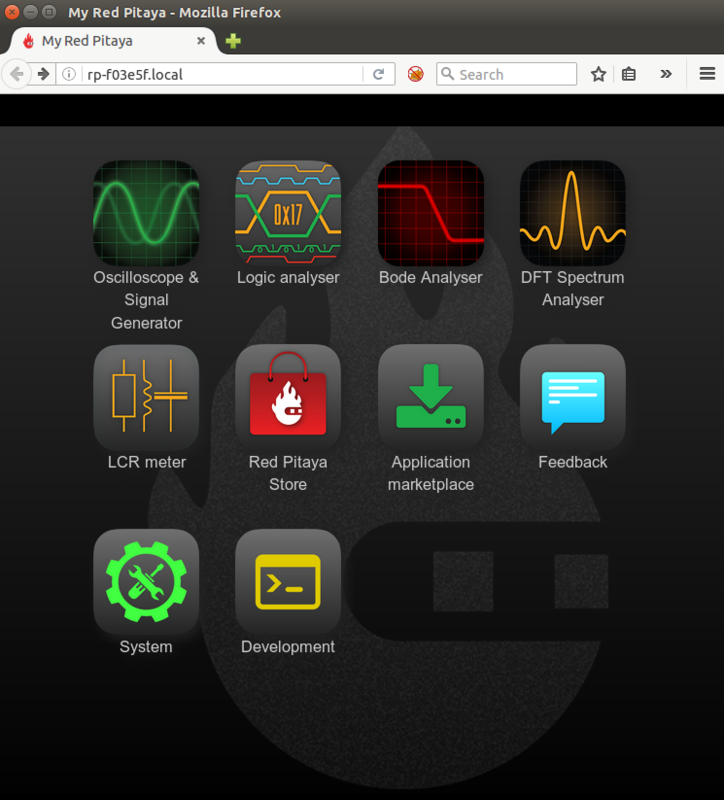 Having a graphical user interface for your Oscilloscope, Signal Generator, LCR meter and other Red Pitaya applications, directly on your PC without any limitations such are limited commands or controls or any installation of additional software will provide you with a unique working experience. xxxxxx are the last 6 characters from MAC address of your STEMlab board. MAC address is written on the Ethernet connector. Figure 1: Connecting your STEMlab board to the LAN network. After the third step you will get a Red Pitaya STEMlab main page as shown below. Figure 2: STEMlab main page user interface. 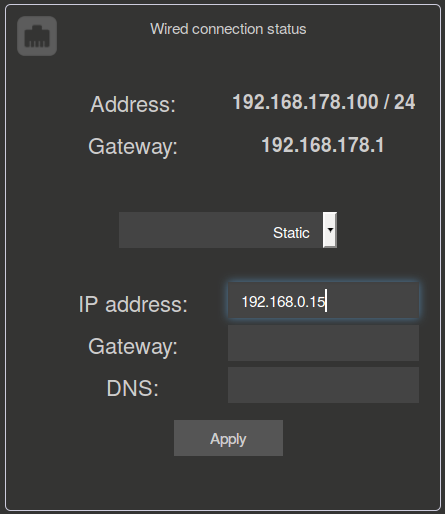 If there are some restrictions for the user to have STEMlab boards on the DHCP LAN network permanently there is a possibility to directly connect to your STEMlab board. 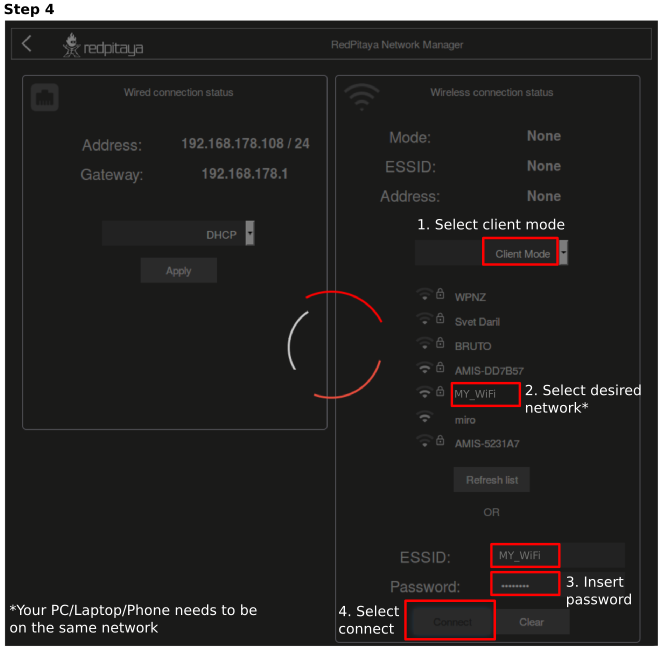 Direct Ethernet Connection was enabled from the start but until now some additional settings on the user’s PC (static IP configuration) were necessary in order to set connection correctly. This step has been eliminated with the NEW OS 0.97 (and newer) and the only step needed is to plug the ethernet cable from your PC to the STEMlab board. If you experience some problem when using Direct Ethernet Connection described above, try to *disable WiFi* connection on *your PC* (if it has been enabled) and *reset the STEMlab* board(power off/on). If the problem still persist you can try STATIC IP configuration described below. This type of connection requires additional settings on your PC and STEMlab board. 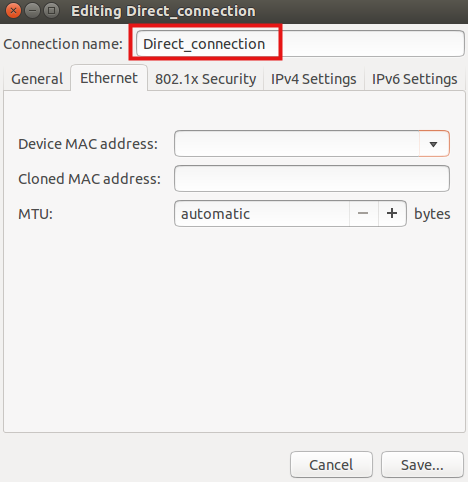 This connection is also arranged via Network manager application so users should first have access to the LAN (DHCP) network in order to arrange static IP on the STEMlab board. 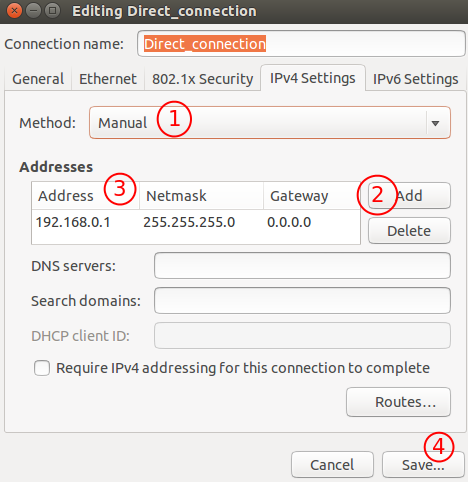 How to set direct Ethernet connection is described bellow. First step in connecting STEMlab board directly to LAN network and setting a static IP on it. Use recommended connection described in Local Area Network (LAN) section. Once you are successfully connected to your STEMlab board, open Network Manager and chose Static option. Input the static IP and click Apply. DNS servers (can be left empty) and click Save button. Once you have this settings arranged, connect Ethernet cable between your STEMlab board and PC, open web browser, in the web browser URL field input chosen STEMlab board static IP (in our example 192.168.0.15) and press enter. 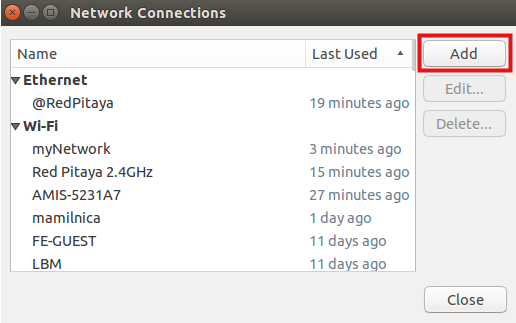 This type of the connection will enable wireless connection to the Red Pitaya STEMlab board via your local WiFi network. In order to connect your STEMlab board to the same WiFi network on which you have connected your PC/Laptop first you need to use LAN connection. 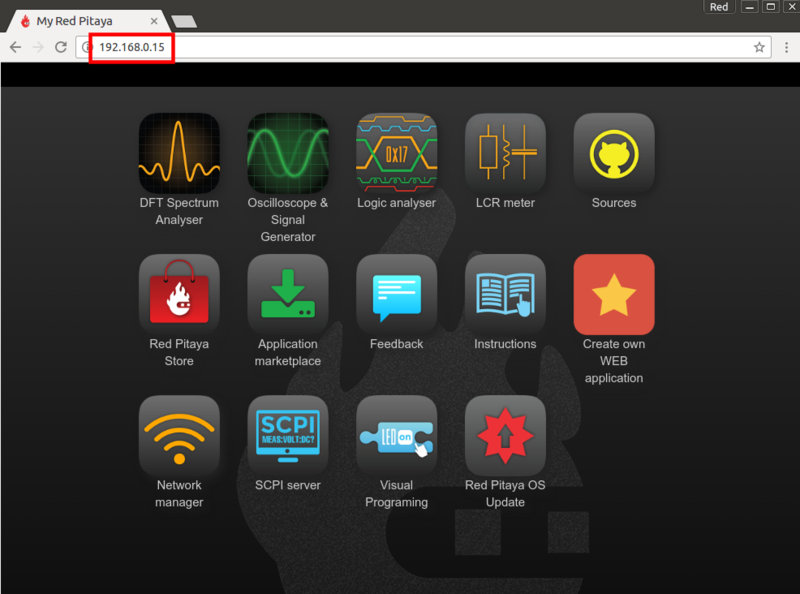 Access your STEMlab board via web browser and start Network Manager application. 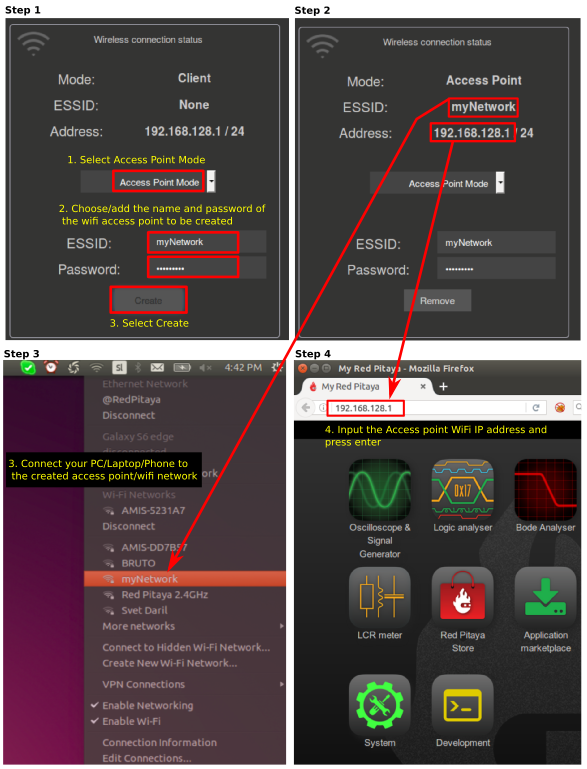 Trough this application all network settings of the STEMlab board are manageable. Simply select the desired WiFi network, input password and select connect. Once you have arranged WiFi network you don’t need LAN connection anymore and after the restart of the STEMlab board it will connect to the preset WiFi network automatically. Connecting the STEMlab via WiFi network the additional WiFi dongle is needed. WiFi dongle is available here [Link to RS or similar]. Insert WiFi dongle in the USB plug on the STEMlab board. Recommended WIFI USB dongle is Edimax EW7811Un. In general all WIFI USB dongles that use RTL8188CUS chipset should work. When the USB WiFi dongle is plugged in, the system will recognize it and enabled additional settings. Select Client Mode, Desired WiFi network, Insert password and click Connect. When your STEMlab board is connected the IP address will be shown on the user interface. This IP address is only for WiFi connection. You can check the connection by inputting a WiFi IP address in the web browser URL field (press enter after inputting). Now you have WiFi connection established. If you restart STEMlab board it will connect to selected network automatically (if selected network is available). Also you can disconnect LAN connection and your board will be still available over the WiFi network i.e WiFi IP address. 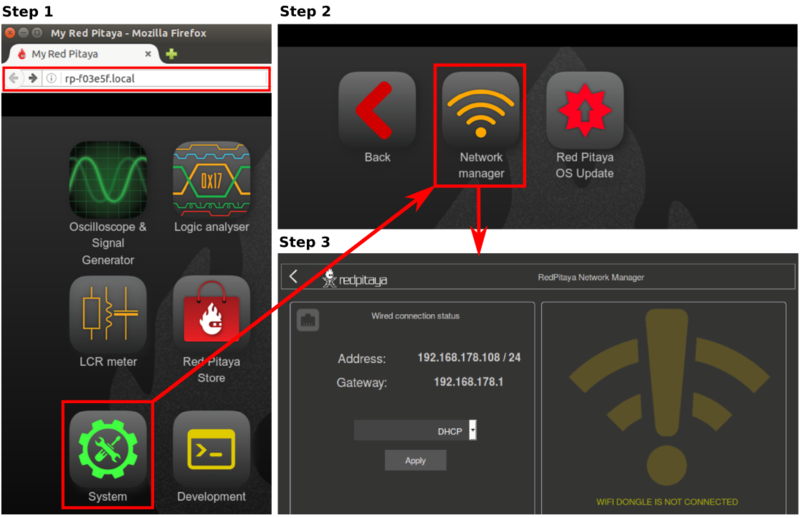 WiFi networks are generally not robust and the full performances of the Red Pitaya application can be affected. When using Raspberry Pi WiFi dongle, an issue of the dongle not being detected can arise. To mitigate, detatch the power cable from Red Pitaya and wait for about a minute before powering up the Red Pitaya again. When there are no LAN or WiFi networks available, STEMlab can act as an access point. This will allow you to connect your PC/Laptop, Tablet or smart phone to the STEMlab directly over WiFi. To use STEMlab as an access point a Raspberry Pi USB WiFi dongle is needed. Follow the steps bellow to enable Access Point and connect to it. 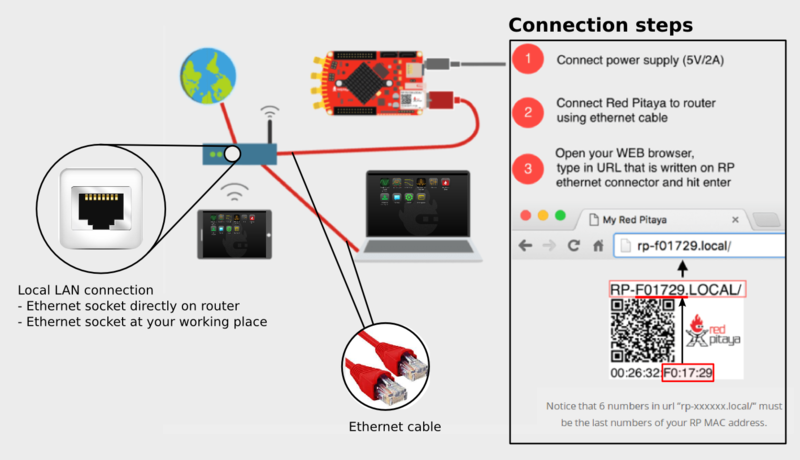 Connect your PC/Laptop/Tablet/Phone to the network created by STEMlab board. Input Access Point network IP address to the web browser URL field and press enter. When Access Point is enabled on STEMlab, it will continue to boot in Access Point configuration, untill it is disabled in the Network Manager.